Robbins machine is first TBM used in the country since over 20 years. 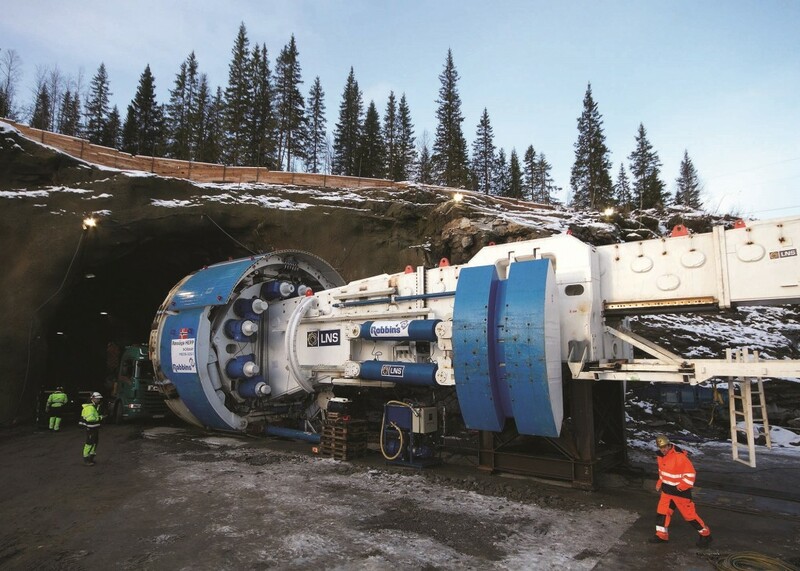 The 7.4 km (4.6 mi) long headrace tunnel for the Røssåga Hydroelectric Project offered up a number of challenges to the crew. “We bored through hard, quartz-rich rock with rock strengths up to 300 MPa (43,500 psi) UCS and softer karstic limestone with water ingress,” explained Tobias Andersson, TBM manager for contractor Leonhard Nilsen & Sønner (LNS). Despite the geological challenges, the TBM performed well and achieved a record production of 250 m (820 ft) advance in one week, as well as a high of 54 m (177 ft) in one day. Advance rates consistently ranged from 180 to 200 m (590 to 660 ft) per week throughout the project. The hard and abrasive rock required both fine-tuning of the disc cutters and a learning curve with regards to TBM operation. “We overcame the rock by adapting driving parameters to the different geology, cutter wear and vibrations of the machine. We had regular maintenance, but most important of all we got really good at changing the cutters, with times down to 10 minutes per cutter change, which couldn’t have been done without good team work,” said Andersson. It was the many cutter changes that prompted the team of LNS and Robbins to look for a better solution. “Extremely hard rock (above 250 MPa/36,300 psi) will always be a great challenge for any cutter. The very special features of the rock encountered combined with the extreme hardness made us go back to the Robbins Cutter Department to develop special cutter rings for the project. These rings increased the cutter life significantly for the project and contributed to the good production,” said Sindre Log, general manager of Robbins Norway. The Robbins TBM was launched following Onsite First Time Assembly (OFTA) in January 2014, less than 12 months after contract signing, and was from the outset designed for hard rock conditions. A Measurement While Drilling (MWD) system was included to analyze the ground conditions ahead of the TBM, while probe drilling was done systematically throughout the project. “This is a strong and simple machine ready to tackle hard rock conditions, but also designed to handle softer rock, which allowed for fast excavation. We had good support from competent Robbins field service,” said Andersson. After all the obstacles, it was clear that the breakthrough ceremony celebrated a triumph of teamwork as well as a new chapter for TBMs in Norway, according to Robbins. “Our whole jobsite was gathered for the event: LNS management, representatives from Robbins, and our client Statkraft. People said it was the best breakthrough event they had seen,” said Andersson. Now that tunneling is complete, project owner Statkraft will work to commission the tunnel and fill it with water by spring 2016.